You will talk with a LIVE person! No message machines, no voicemails, no waiting for a call back! Q: What sizes of bottled water do you deliver? A: We offer: 5 gallon and 3 gallon refillable bottles and cases of ½ liter, 1 liter and 1 gallon bottles. Q: Do you have BPA-Free bottles? A: Yes, We do! Please request BPA-Free bottles when you place your order. Q: Is there a minimum # of bottles required for delivery? A: No, but in order to take advantage of our price break, 4 or more bottles per delivery is the most economical. Q: How often are deliveries made? A: Typically, residential accounts using 1-9 bottles per month are scheduled for Once-A-Month deliveries. Business accounts that use 10 or more bottles in a month and don't have a lot of room for storage can be placed on a bi-weekly schedule. Q: Do you rent electric hot and cold water dispensers? A: Yes, we have a monthly rental program for business accounts only. Q: I need some type of water dispenser in my home-what options do you offer? A: We offer new or used, electric hot/cold dispensers for purchase. Please call the office to inquire about price and availability. We also have a nice selection of ceramic crocks, floor and counter top stands, and hydropumps. Visit OUR PRODUCTS & PRICING page to see available styles. Q: Do you have racks available to store water? A: We offer Bottle Buddy brand plastic racks. They are available to commercial accounts for rent or purchase, and for purchase by individuals. Bottle Buddy racks are also available at Wal Mart and online-we encourage you to check online pricing. A: We make weekly, bi-monthly and monthly deliveries in Eugene, Springfield, and the McKenzie Valley. Areas serviced Once-a-month include: Coburg, Harrisburg, Junction City, Veneta/Elmira, Creswell, Cottage Grove and Pleasant Hill. Deliveries to all other areas are made by special arrangement. Please call our office for details. Q: How do I know when its my delivery day? A: You are provided a calendar card showing your delivery dates for the entire year. Remember to request additional calendar cards! Q: What if I forget my delivery day and forget to leave out my empties? A: Call our office to reschedule your delivery. You may incur a small $10 delivery charge if we are not already in your area. For rural deliveries, you may have to wait until our next scheduled delivery. A: You will receive an invoice at the time of delivery. You may mail a check, you can call our office and make a payment by using your debit or credit card or you can sign up for monthly autopay. To Set Up Delivery To Your Business Or Home! 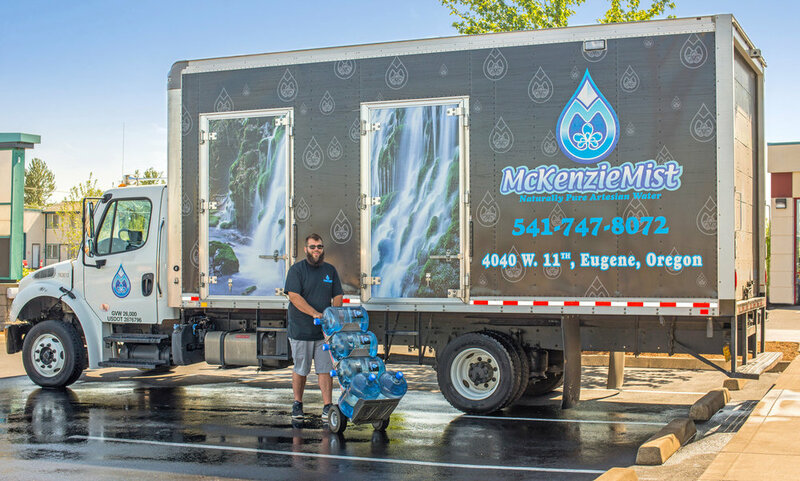 Remember-if your water supply runs low between deliveries-you can always come to the McKenzie Mist store at 4222 W 6th Avenue or visit Wynants in downtown Springfield to pick up fresh bottles! If you need an emergency delivery a modest special delivery fee will be added. We really enjoy having McKenzie Mist water in our waiting room for our patients and staff! They have great service and do a great job in delivering the bottles and cups to our office. Thank you McKenzie Mist. I am writing to thank you for the quality of service provided by your company. We sincerely appreciate your efficient, gracious customer service. Distributions Services appreciates all your help in getting water supplied for the Salem area Department of Corrections. You went above and beyond assisting us in a time of emergency. Thank you for your assistance in this matter.